We help our customers with overseas expansion and business continuity in times of emergency. 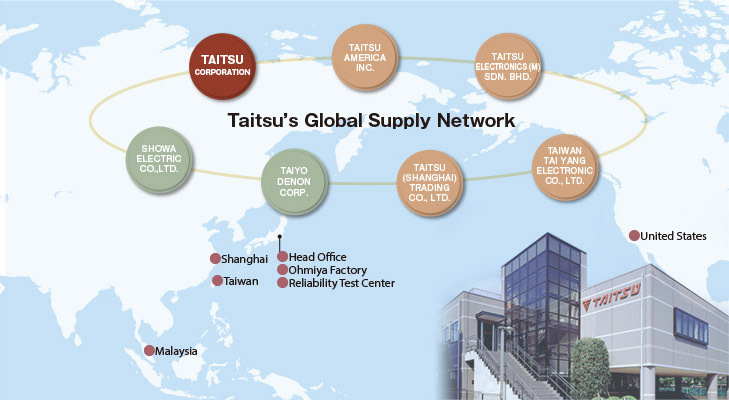 Taitsu has a total of multiple production and sales bases, located in Japan, the United States, and Asia. We can propose optimal solutions to customers planning to produce their products at overseas locations. Even in the case of a disaster, our Global Supply Network enables us to respond quickly and flexibly to customer needs. We will apply our system for uninterrupted supply to assist our corporate customers with their business continuity.